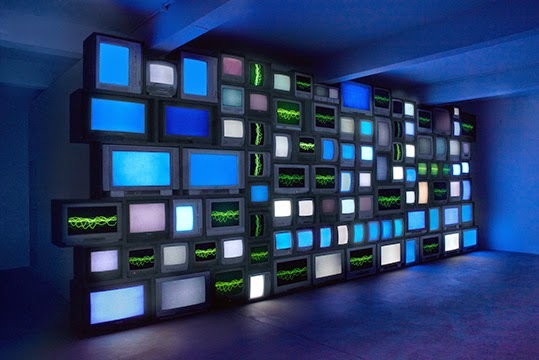 Channels by London-based British/American artist Susan Hiller (b. Tallahassee, Florida, USA, 1940) is on show at Den Frie Centre of Contemporary Art, Copenhagen, Denmark (15 Nov 2014 - 5 Mar 2015). The expansive audio-sculptural installation comprises disembodied voices reporting on so called near-death experiences. The work presents audio accounts in multiple languages from people who believe they have experienced death and returned to life. Channels, 2013. Multi-channel video installation comprising television sets, media players, dvd players and signal splitters. Courtesy of Den Frie and the artist.